Intelect Legend XT/Intelect TranSport - 1 cm² Sound Head Applicator Pre-calibrated, waterproof and ergonomically designed sound head applicators which operate at 1 and 3.3 MHz frequencies. 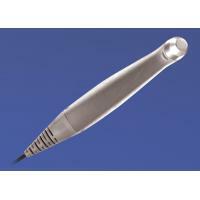 The 1 cm² is especially designed for hand therapy applications. All sound head applicators are interchangeable with Electronic Signature Recognition residing on all transducers. Head warming feature on all applicators. Applicators are also available in 2 cm² , 5 cm² and 10 cm² sizes. Stimulator & Electrode Accessories can be found in our extensive online collection of products from globally recognized and trusted brands, including Chattanooga. An excellent option to consider is the Intelect Sound Head Applicator.